My first payment from Amazon was ten years ago. Unlike Google, which pays by bank transfer in Australian Dollars, Amazon still sends old fashioned paper cheques, in US dollars. Banks charge a considerable amount to deposit a foreign cheque, so I have the system set to only send one when the balance is high enough to make it worthwhile. 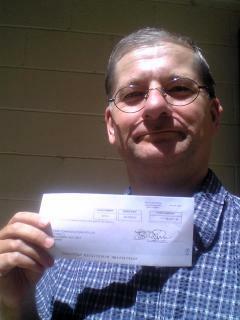 So I was surprised to receive a cheque this week for fourteen cents.